A microchip is a permanent method of electronic identification. The chip itself is very small – about the size of a grain of rice – and is implanted subcutaneously (just under the skin) between the shoulder blades at the back of your pet’s neck. 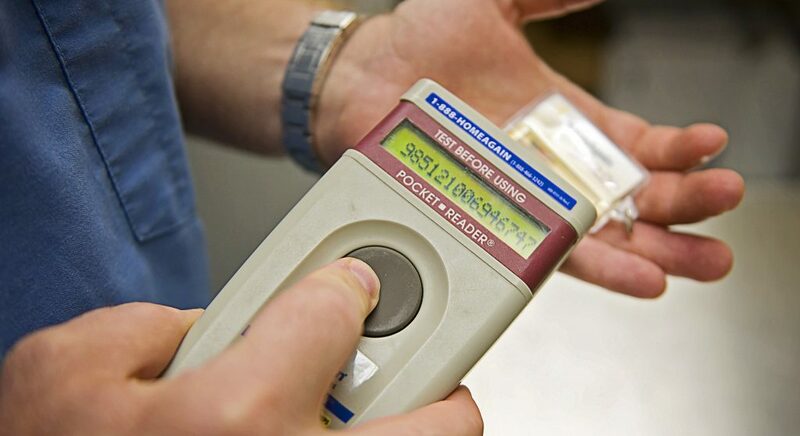 Each chip has a unique number that is detected using a microchip scanner. Why do we use Microchips? We use microchips as a form of identifying a pet to a specific owner, guardian or shelter/rescue. Unfortunately, pets go missing all of the time and a microchip is one of a few ways that a lost pet can be identified and returned to his/her owner/guardian. Should I rely on just a Microchip? No, there are a few problems that must be discussed when talking about microchips. First even if your pet has a microchip, if it isn’t registered to you with up-to-date information when your lost pet is found whoever scans your pet and discovers the microchip (shelter staff, veterinarian, etc.) will not be able to get reach you. 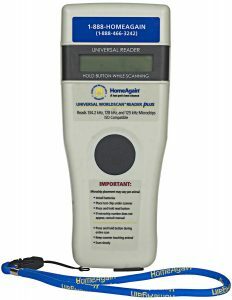 Second, if the chip scanner used by the person scanning your lost pet doesn’t read your type of chip they will think your pet doesn’t have one. We can only hope that they have more than one scanner to test, but I there is no guarantee of that. Third, not all chips and databases are created equal. There are chip manufactures that may not have 24-hour service or allow their data to be accessed by certain online Universal Microchip Lookup Tools like the one from AAHA (American Animal Hospital Association). Some manufactures claim microchips are designed to work for 25 years. Can I track my missing pet with a microchip? No, they simply are not designed that way. Microchips are not a tracking device. They are based on RFID (Radio-frequency identification) technology which doesn’t require a power source. GPS devices require a power source. Why is having 24-hour phone support important? If a person or rescue finds a missing pet that has a microchip and it is injured, they will need to contact the owners to get medical consent in order to attend to its medical needs. Depending on the injuries you may only have a short time period to provide medical care. Therefore, it is so important to keep your information, especially your contact phone numbers up-to-date. I have a microchip number now what? Some microchip scanners will also give you a phone number to call, but when that doesn’t work you can check online. There is a Universal Microchip Lookup Tools from AAHA (American Animal Hospital Association) the web address is http://www.petmicrochiplookup.org. Now as we stated above, not all chip manufactures provide information to this database, so you may have to do some more research. There are other charts out there online that will give you a most likely manufacture contact information based on the number provided by the microchip. • No chip number can start with a letter. • No chip number is over 15 digits in length, or less than 9. • If a chip number has alpha characters in it, it can be only 10 characters in length. Some veterinarians will register the microchip they implant, but it is a good idea to ask what brand it is and go online and verify the information they have entered. If you must do it, then you will complete the paperwork that comes with the chip and send it to the registry or do it online if that option is available. Some companies charge a one-time registration fee while others charge an annual fee. You’ll also receive a tag for your pet’s collar with the chip number and registry phone number. If your pet came from a shelter or rescue group, the chip may be registered to them. It is a good idea that after the adoption (if this is allowed in your adoption contract) that you update that registration information with your contact info. What can I do if my pet has a microchip number, but they aren’t in the online database? Well, the good news is there are two different companies that you can register your pet’s chip with to either have a primary source of information or as a secondary backup to manufacturer of the chip in your pet. They are Home Again and Found Animals. Home Again charges around $20 per year (which includes several benefits) and Found Animals is free. Can a microchip move inside my pet? It is always a good idea to have your pet (or a lost pet you are helping) scanned all over their whole body. Although some may say it is less likely today that microchips will migrate, we still encounter pets with chips in various places of their bodies other than where they were implanted. We have even detected microchips that moved to the back legs, so it is a good idea to check all over. Microchips are a great tool in helping identify your pet or a lost pet, but we still believe all pets should be wearing a collar and tag as well. When asked, “Where do you first check when trying to identify a lost or stray pet?” more than 80% of rescuers say they check the tags first. While it is true that collars can break off when a pet roams outdoors, it is more probable that a collar and tag on your pet will provide the finder all the information needed to find you and get your pet home safe. If you want to rely on your microchip only, be sure to have it checked every time your pet sees your veterinarian for shots. Another good idea is if someone is holding a microchip clinic locally stop by with your pet and ask them to check it. I am sure they would be more than happy to help. REMEMBER KEEP YOUR MICROCHIP INFORMATION UP-TO-DATE!! Sarah Hoopingarner’s heart sank when she walked out of the rest area along Interstate 81 in Dorrance Township on April 15. Two of her three dogs were were tied to a picnic table and her husband Jack was nowhere in sight. Neither was Hoopingarner’s third dog, Red. Minutes later, after Hoopingarner put the other two dogs in their camper, Jack emerged and confirmed Sarah’s worst fear. The Hoopingarners were traveling through the area headed back home to Connecticut after vacationing in North Carolina. The quick stop at the rest area was routine enough, and as Sarah used the restroom Jack walked their three dogs. 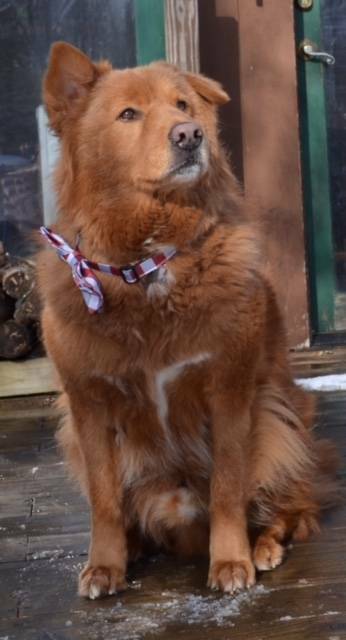 That’s when Red, who is a 6-year-old chow retriever mix, slipped out of his harness and bolted, setting off a two-week search that tested the Hoopingarners, rallied the Mountain Top community and unveiled a hero. Immediately after losing Red, the Hoopingarners channeled their panic into rescue mode. 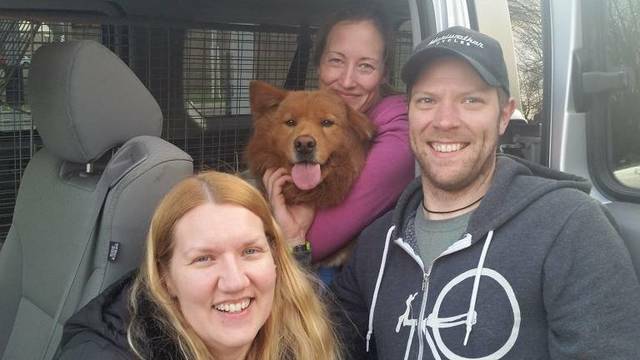 They canvassed the Mountain Top area with flyers, desperately followed leads and drove around day and night searching for their dog. Because they had already had their camper with them from vacation, the Hoopingarners parked it near Alberdeen Road hoping Red would find them. Even though the couple was more than 200 miles from their home in Connecticut, they weren’t going anywhere without Red. That first week, the Hoopingarners searched for Red around the clock to the point of exhaustion. Sarah said Mountain Top residents — strangers — were even driving around looking for Red after they read about the plight on Facebook. People routinely stopped by the camper to offer help, drop off food and water and even offered a place to stay. Meanwhile, sightings kept coming in. Red sightings were reported in Slocum Township, near Church Road, and one call came in from the state police that Red was walking along the interstate in the middle of the night. The Hoopingarners immediately followed every reported sighting, and at one point Sarah got to within 10 feet of Red. But when she approached, the panicked dog ran again. “He was in flight mode. He is skittish and his instinct was to run, and keep running,” Sarah said. On April 22, after seven days of searching, the Hoopingarners were faced with a daunting reality. They had to go back home. There were jobs to return to back in Connecticut, and they had already been gone for a long time. Walking back into their home was heartbreaking, Sarah said. When the Hoopingarners returned to Mountain Top, they knew they couldn’t continue the search on their own. At 2 a.m. April 26, they sent a message to Tracey Morgan-Chopick, who operates Luzerne County Pet Recovery Services with husband Jeff. The Hoopingarners pleaded for help, and Morgan-Chopick immediately went to work. Having recovered countless lost pets over the years, Morgan-Chopick already had a plan. She put out six feed stations in the areas where Red was seen and monitored them with trail cameras. Morgan-Chopick also handed out 400 flyers going door-to-door in the Mountain Top area and posted dozens more in local businesses. While Morgan-Chopick’s know-how when it came to finding lost pets was invaluable, her advice on what not to do was perhaps most important. That advice played a key role in Red’s rescue. A day after Luzerne County Pet Recovery Services got involved, they also got a break. Morgan-Chopick was driving through Mountain Top on April 27 when she got a call from a resident on St. Mary’s Road. 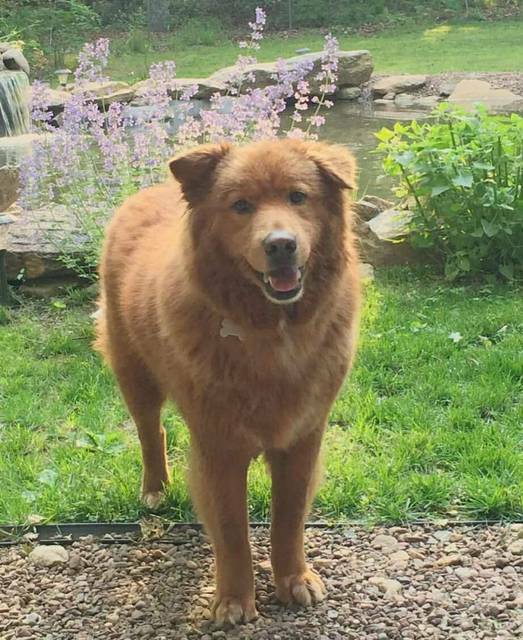 The caller saw one of Red’s flyers at the grocery store and told Morgan-Chopick she thought the dog was in her yard. Soon after Morgan-Chopick left, the resident called again. Red was back, hit the food and was now lying the yard. Morgan-Chopick was sticking to her plan to set a live trap after Red walked away again. Later, with everything ready to set the trap, Morgan-Chopick pulled into the driveway and met the resident, who said Red crawled under her porch. Sarah and Morgan-Chopick’s husband arrived on the scene and the trio converged on the porch, blocking every exit. Sarah peered underneath and Red began whimpering. “The minute I saw him I wanted to go to him, but Tracey and her husband said you can’t do that. So I talked to him softly and crawled under the porch a bit, and Red scooted to me and I was able to leash him,” Sarah said. With Red no longer on the run, Sarah and Morgan-Chopick drove back to Jack who had no idea the mission was complete. Morgan-Chopick opened the door to reveal Red sitting on Sarah’s lap. “Red was so happy and Jack and Sarah were crying hysterically. That moment makes all the work and effort worth it,” Morgan-Chopick said. Checkout This Lost & Found News Article from the Citizens’ Voice below. Trouble viewing CLICK HERE for PDF version. This Halloween lets keep our pets safe. Halloween is a time when our pets have a greater chance to escape from us. The top Halloween hazards for pets are escaping and being poisoned. Both animal shelters and veterinarians see a spike in their business during the Halloween season. Make Sure to follow us on Facebook. 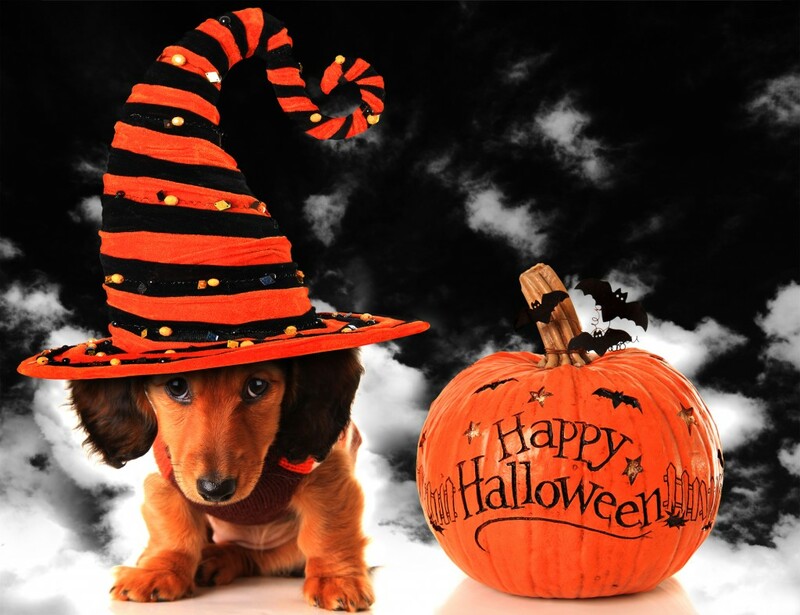 Below we have a few pet safety tips to keep our furry family members home this Halloween. Before the trick-or-treating starts, put your pets in a quiet room where they will be safe from all the Halloween activity. The constant opening of the door for trick -or-treating gives them opportunity to escape while you are distracted. When going out trick-or-treating, leave your dog at home. Dogs can be easily excited by the Halloween commotion, and a bite or a lost dog will quickly end the evening’s fun. After you’ve let your pets out of their safe room, place treats safely in a high cabinet secured with a lock or child-safety latch. Many foods, such as chocolate, gum and xylitol (a sweetener used in many foods) are hazardous to them. Keep treats away from your children unless you are observing them. Children may make the harmful mistake of sharing with their four-legged friends. Make sure they are micro-chipped, the chip is registered and your information is up-to-date. You can get them a GPS collar to wear just in case they get away. Make sure they are wearing something bright and reflective so at night people can see them. NO RETRACTABLE LEASHES!! With all of the kids and parents running around you won’t have the control you need to keep the close by and safe. Also retractable leashes break very easily or slip out of your hands. What do I do if my pet gets out during Halloween? First thing is DO NOT YELL THEIR NAME!! When you yell their name they can sense the tension in your voice and they will think they are in trouble, so they will most likely run away. DO NOT CHASE after them. Running after your dog will certainly cause them to run away from you. Best thing to do is grab a smelly treat and get down on the ground, do not make direct eye contact, wait for them to come to you and if you try to speak to them talk softly and in a high voice. You have to remember that a lost pet does not take the time to see who is coming towards them they just think predator and run away. If your dog leaves your immediate area, inform your neighbors to be on the lookout and to let you know if they see your dog, but advise them of the tips above. Most people generally want to help, but they tend to do all the wrong things first. Refrain from sending out search parties because if an animal sees a bunch of people coming at them it is very intimidating and they may flee farther away. If you live near woods and you know a bunch people with quads or side-by-sides that say, “we will go searching for you.” BAD IDEA!! The noise they put off is loud and scary to a dog. If your cat gets out, most cats do not travel far so check under porches, decks, cars, bushes, anything they can hide under. Also ask your neighbors to check their yards as well. Visit our Facebook Page and PM us the details of your lost pet. Facebook can get the word out about your lost pet very quickly, but it is important that you have the right people helping you. Untrained help can hurt the situation. When posting please add all the above tips such as DO NOT CHASE, DO NOT YELL their name. Instead ask people to please Private Message you as the owner with sighing information. Never post sighting information, because some people will go out trying to help and not listen to our tips and make the situation worse. Following the advice of a trained pet recovery specialist may literally be the difference whether your loved pet makes it back home or not. I Found A Stray Dog, What Do I Do?